320g pack of ready prepared oriental stir-fry vegetables (or your own mixture of vegetables such as bean sprouts, carrot batons, water chestnuts, bamboo shoots, mangetout, Chinese leaf, red onion, cabbage, sugar snap peas, baby sweetcorn etc). This recipe is very versatile and adaptable to whatever ingredients you have in your fridge. It serves 2 generously or 3 for smaller appetites! 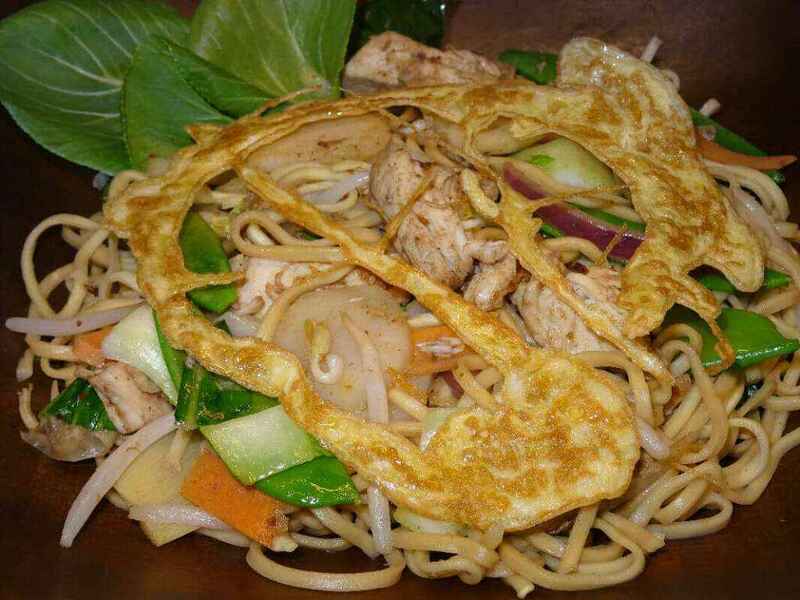 For a speedy supper, you can use pre-cooked chicken, pre-cooked ready to wok noodles and a pack of ready prepared oriental vegetables and omit the omelette. 1) If using dried noodles, cook them in a pan of boiling water as per the pack instructions, drain into a sieve and refresh with cold water to stop them sticking together. 2) To make the optional crispy omelette topping, heat a non-stick frying pan and add a tablespoon of oil. Beat the egg in a cup and season with a few drops of fish sauce or a pinch of salt. Once the oil is really hot (so that the egg will set the moment it hits the pan) drizzle the egg mixture in a criss-cross pattern and cook for a few moments until it starts to go crispy. Flip it onto a plate and keep warm. 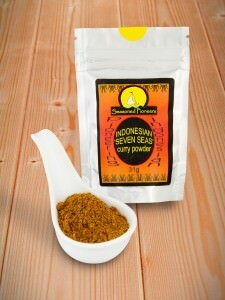 3) In a jug or bowl, mix together the Indonesian Seven Seas spice blend, soy sauce, rice wine vinegar, ginger and ginger syrup (if using). 4) Heat your wok, add a dash of oil and then the sliced chicken. If using uncooked chicken, stir-fry over a medium heat until cooked thoroughly. 5) Add the sauce/spice mixture to the wok and once it is sizzling add your vegetable mixture and the pak choi. 6) Stir-fry for a couple of minutes, then add the noodles and continue to stir-fry until everything is hot and the vegetables are just cooked. 7) Pile onto plates and top with crispy omelette, if using.